The Slik S Pole Digital (a name that is surely butchered by translation) is a helpful way for SLR photographers to get that extra bit of height for a shot. Its 30cm to 60cm can help a camera reach those tough spots, like over private fences and up to bedroom windows. The $58 pole can also be attached to a tripod, which makes more sense for serious photographers who are trying to capture images of a bit more legitimacy (sunsets, not sunbathers). 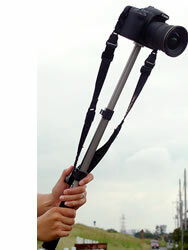 Gizmodo Paparazzi Tip: If you're not looking for tripod attachment, just go with a monopod instead - you will gain reach and the ability to plant the camera to the ground.